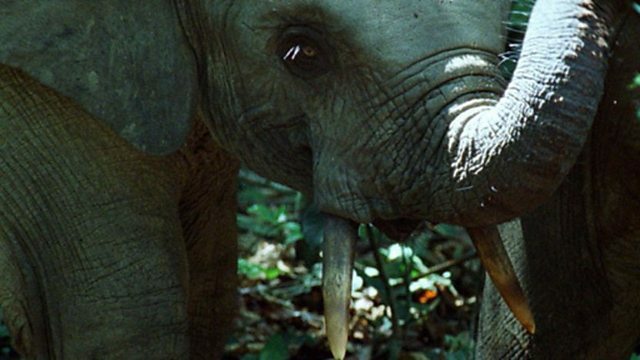 Forest elephants have become masters of opportunity. The giant hard fruits of the omphalocarpum tree fall to the ground and the sound echoes through the forest which attracts forest elephants. As big as melons and as hard as coconuts, the fruits are ripe - 2 kilos of fruit for those that can break it open. The smell is irresistable too, but this fruit is so hard it seems not even an elephant will be able to dent it. Or can it? Using its tusks as precision tools some elephants are capable of prising open the fruit, stabbing it and splitting it into pieces. This behaviour has only recently come to light. Fruit is the forest elephant's staple and this manna from the heavens is full of energy. But it's also a rare gift and it takes more than one ripe omphalocarpum tree to feed Africa's largest land mammal. So elephants have learned to make the most of these opportunities. They know all the fruiting trees, and each is pinpointed on amental map of the forest in their heads. As they travel they follow a network of paths carved out of the forest to over a hundred species of fruiting tree. To survive in this hard world, elephants have become masters of opportunity.